Like most stir-fries, this can be made in minutes if you have all the ingredients chopped and ready to go. Purchase soba noodles that are low in sodium, or substitute wide whole wheat noodles, which also are low in salt. Find hoisin, a sweet sauce made from soybeans and spices, and Thai chili sauce in most supermarkets. Combine all Sweet Ginger Sauce ingredients in a small pan, using chili sauce to taste. Heat to a simmer and cook for 1 minute. Set aside. Cook the soba noodles 1 minute less than directed on the package, drain and set aside. 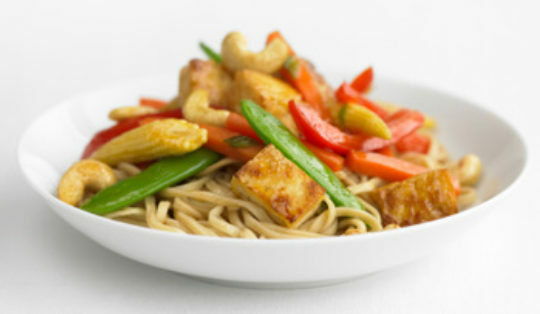 Heat the sesame and peanut oils in a nonstick skillet or wok over high heat until hot. Stir in the tofu, scallions, garlic, carrots, snow peas, bell peppers and mushrooms. Stir-fry for 2 minutes. Lower the heat to medium; add the Sweet Ginger Sauce. Stir in the spinach, bean sprouts, and reserved soba noodles. Cook just until the spinach wilts, then add the cilantro. Serve immediately, garnished with lime wedges. *Prepare tofu for cooking by thawing at room temperature or by immersing (wrapped) in boiling water. Be sure to squeeze as much moisture out as possible.